When the Three Bakers bread arrived, I quickly stuffed it into my freezer. I figured I’d try it one of these days – I wasn’t all that excited about it. Then, my mother in law asked me to bring some GF bread to enjoy at dinner. She didn’t have any and wanted to keep everything GF for me. So I pulled one of the Three Bakers loaves out of the freezer (Whole Grain White – affiliate link) and thought to myself that tonight would be as good as any night to give this gluten free bread a try. Now, this is where things get good! I took a slice of the bread and put it in my mouth, expecting the worse. Like I said, I’d given up bread long ago and my expectations were low… very low. But then something amazing happened. I actually LIKED this bread! Was I feeling okay? Were my tastebuds compromised? The whole process was confusing. Gluten free bread that actually tasted good – was I dreaming? I’ve never tasted a gluten free bread I liked this much. (I do semi-like one other brand, but Three Baker’s whole grain white is superior by a mile!) My mother in law, father in law, husband and kids all tried the bread. The verdict was in! Even these gluten-eating people were surprised at how much they liked Three Bakers bread! I had defrosted the entire loaf, and we didn’t eat it all that night, so I took the leftovers home and decided that we’d make French toast the next day. To be honest, I hadn’t make French toast since I stopped eating bread in April 2012 after my Celiac diagnosis. This was going to be a real treat! Below I share a super easy and delicious recipe for making your own gluten free French toast. I have to admit, my gluten free French toast tasted just like I remembered pre-Celiac diagnosis. Miss French toast? Just because you're gluten free doesn't mean you have to miss out on this tasty breakfast treat thanks to Three Bakers bread! In a large casserole dish, add eggs, water, brown sugar, cinnamon and vanilla. Mix well. Add bread slices and let soak for 30 seconds to 1 minute, then flip and allow bread to soak until you're ready to add the slices to the hot pan. Meanwhile, heat a large skillet over medium heat with 2 tablespoons of butter, more if needed to coat pan. Working in batches, add as many slices of bread as fit into your pan without layering or overcrowding. Cook on each side for 1-2 minutes until toast is nicely browned. Remove from pan. 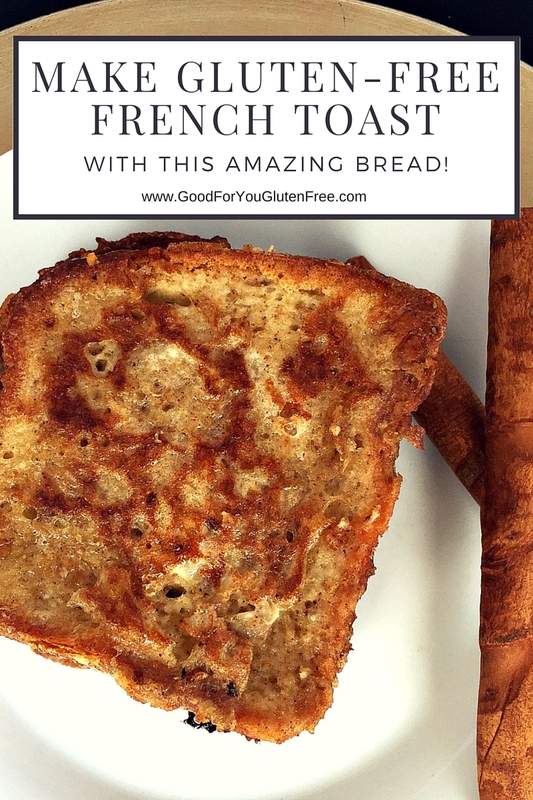 If you’re going to make this gluten free French toast recipe yourself, I highly recommend you use Three Bakers Gluten Free Bakery bread. I personally enjoyed the Whole Grain White (made with whole grain brown rice flour, tapioca starch and potato flour), but you can also enjoy many varieties of breads featuring ancient grains, seeds, rye, cinnamon raisin, etc. or other baked goods like gluten free pizza dough and gluten free hamburger and hotdog buns. Three Bakers products are certified gluten free and made in a dedicated gluten free facility. The breads are all soy free and dairy free too. Find a store near you that carries Three Bakers products or order Three Bakers products online from Amazon – don’t you just love that Amazon has everything!?!? Disclosure: Three Bakers sent me samples of its gluten free bread but all opinions in this post are mine. This post contains affiliate links.